What Is Juvenile Idiopathic Arthritis (JIA or JRA)? What Are Juvenile Idiopathic Arthritis (JIA) Causes? What Are Symptoms and Signs of Juvenile Idiopathic Arthritis? When Should Someone Seek Medical Care for Juvenile Idiopathic Arthritis? What Tests Do Health Care Professionals Use to Diagnose Juvenile Idiopathic Arthritis? What Imaging Studies and Other Tests May Be Used to Diagnose Juvenile Idiopathic Arthritis? What Are Juvenile Idiopathic Arthritis Treatments? What Are Home Remedies for Juvenile Idiopathic Arthritis? What Is the Medical Treatment for Juvenile Idiopathic Arthritis? How Do Biologic Response Modifiers Help Juvenile Idiopathic Arthritis? What Medications Treat Juvenile Idiopathic Arthritis? Can Surgery Help Patients With Juvenile Idiopathic Arthritis? What Other Therapies May Help Juvenile Idiopathic Arthritis? Do Patients With Juvenile Idiopathic Arthritis Need Follow-up? Is It Possible to Prevent Juvenile Idiopathic Arthritis? What Is the Prognosis for Juvenile Idiopathic Arthritis? What Are Complications of Juvenile Idiopathic Arthritis? How Can Patients With Juvenile Idiopathic Arthritis Find Support Groups and Counseling? Rheumatoid arthritis is a chronic (long-standing) disease that damages and eventually destroys the joints of the body. The damage is caused by inflammation, a natural response of the body's immune system that is misdirected in rheumatoid diseases. Arthritis means "joint inflammation." The inflammation in the joints causes pain, stiffness, and swelling as well as many other symptoms. The inflammation often affects other organs and systems of the body as well. If the inflammation is not slowed down or stopped, it eventually destroys the affected joints and other tissues. Pauciarticular disease affects only a few joints, fewer than five. The large joints, such as the shoulder, elbow, hip, and knee, are most likely to be affected. This type of JIA is most common in children younger than 8 years of age. Children who develop this disease have a 20%-30% chance of developing inflammatory eye problems that can be serious, and these children require frequent eye examinations. Children who develop this disease when older than 8 years of age have a higher-than-normal risk of developing an adult form of arthritis. Children can outgrow the arthritis. This is the most common form of JIA. Polyarticular disease affects five joints or more, sometimes many more. The small joints such as those in the hands and feet are most likely to be affected. This type can begin at any age. In some cases, the disease is identical to adult-type RA. Systemic disease affects many systems throughout the body. Children may have high fevers, skin rash, and problems caused by inflammation of the internal organs such as the heart, spleen, liver, and other parts of the digestive tract. It usually, but not always, begins in early childhood. Medical professionals sometimes call this Still's disease. Enthesitis-related disease involves inflammation of the ligaments and tendons at their attachment points to adjacent bone. Additionally, the spine is typically involved with inflammation. Because of the inflammation of the spine, this form of JIA is often referred to as a spondyloarthropathy. Psoriatic arthritis disease is characterized by not only joint inflammation but inflammatory skin disease called psoriasis. Psoriatic arthritis features patches of inflamed scaly skin, pitting and lifting of fingernails and toenails as well as inflamed, swollen digits. There may be a history of psoriasis in other family members. Children with JIA may experience complications specific to their type of JIA. The most common complications in children with JIA relate to adverse effects of medications taken to treat the disease, particularly nonsteroidal anti-inflammatory drugs (NSAIDs), such as ibuprofen (Advil, Motrin). When taken frequently, these drugs can cause irritation, pain, and bleeding in the stomach and upper intestine. They also can cause problems in the liver and kidneys that often have no symptoms until they are very severe. In some cases, the child must undergo frequent blood tests to screen for these problems. Some children with JIA have emotional or psychological problems. Bouts of depression and problems functioning in school are the most common. The death rate in children with JIA is somewhat higher than in healthy children. The highest death rate in children with JIA occurs among patients with systemic JIA who develop systemic symptoms (such as pleural and pericardial disease). JIA can also evolve into other diseases, such as systemic lupus erythematosus (SLE) or scleroderma, which have higher death rates than pauciarticular or polyarticular JIA. Treatment for JIA, similar to that for adult-type rheumatoid arthritis, has improved dramatically in the last 30 years, thanks mainly to the development of new medications. The cause of juvenile idiopathic arthritis is unknown. Like adult-type RA and many other related diseases, JIA is an autoimmune disease. This means that the body's immune system mistakenly attacks the tissues it is supposed to protect. The chronic inflammation of the synovium (the fluid-producing tissue that surrounds the joints) is linked to greater-than-normal activity of the immune system. Normally, the immune system fights "assaults" by "invaders" such as infections or blood or tissue from another person. The immune system produces specialized cells and proteins, which are released into the bloodstream to fight off the "invaders." One important type of immune protein is called an antibody. In autoimmune diseases such as JIA, the cells and antibodies of the immune system attack the body's own tissues. In the case of arthritis, the attack is directed against the synovium, which becomes inflamed. The inflammation causes the synovium to thicken and grow abnormally. As the synovium expands outside of the joint, it presses on and eventually damages the bone and cartilage of the joint and the surrounding tissues such as ligaments and tendons. We do not know what causes the inappropriate autoimmune response. Because the cause has not yet been discovered, we use the term "idiopathic" which means "of unknown cause." Emotional factors and diet do not appear to be risk factors for JIA. According to statistics from the Arthritis Foundation, there are at least 300,000 children in the U.S. with JIA. The symptoms of juvenile idiopathic arthritis vary greatly from child to child. They may be very mild, very severe, or anything in between, and they may change over time, sometimes overnight. Fluctuations of symptoms, whereby they get worse (flare) and then get better or go away completely and resolve (remission), are fairly typical of JRA. Joint pain, warmth, stiffness, and swelling: These are the most common symptoms of JIA, but many children do not recognize, or do not report, pain. Stiffness and swelling are likely to be more severe in the morning. Loss of joint function: Pain, swelling, and stiffness may impair joint function and reduce range of motion. Some children are able to compensate in other ways and display little, if any, disability. Severe limitations in motion lead to weakness and decreased physical function. Limp: A limp may indicate a particularly severe case of JIA, although it also may be due to other problems that have nothing to do with arthritis, such as an injury. In JIA, a limp often signals knee involvement. Joint deformity: The joints may grow in an abnormal, asymmetrical way, causing deformities of the extremity involved. Eye irritation, pain, and redness: These symptoms are signs of eye inflammation. The eyes may be sensitive to light. In many children with JIA, however, eye inflammation has no symptoms. If the inflammation is very severe and not reversed, it can cause loss of vision. The most common types of eye inflammation in JIA are uveitis and iritis. The names refer to the part of the eye that is inflamed, the uvea and iris, respectively. Recurrent fevers: Fever is high and comes and goes with no apparent cause. Fever may "spike" (go high) as often as several times in one day. Rash: A faint, salmon-colored rash may come and go without explanation. Psoriasis rash in those with the psoriatic form of JIA. Myalgia (muscle aches): This is similar to that achy feeling that comes with the flu. It usually affects muscles throughout the whole body, not just one part. Lymph node swelling: This is sometimes called "swollen glands," but the lymph nodes are not glands. They are small nodules of tissue that work as part of the immune system to help remove certain types of dead cells. Normally, lymph nodes are very small and cannot be felt through the skin. When swollen, they can be felt and often are tender to the touch. Lymph nodes are spread throughout the body, but swollen lymph nodes are noticed most often in the neck and under the jaw, above the collarbone, in the armpits, or in the groin. Weight loss: This is common in children with JIA. It may be due to the child's simply not feeling like eating. Weight loss with diarrhea suggests possible inflammation of the digestive tract. Growth problems: Children with JIA often grow more slowly than average. Growth may be unusually fast or slow in an affected joint, causing one arm or leg to be longer than the other. General growth abnormalities may be related to having a chronic inflammatory condition such as JIA or to the treatment, especially glucocorticoids (for example, prednisone). While none of these signs and symptoms point exclusively to juvenile idiopathic arthritis, all warrant a visit to your child's health care professional. It is important to remember that many conditions other than juvenile idiopathic arthritis can cause joint pain, stiffness, and swelling. Examples of conditions that mimic JIA are infections with bacteria or viruses, injury (such as a sprain or fracture), systemic lupus erythematosus, inflammatory bowel disease, Lyme disease, and certain kinds of cancer. Other symptoms of JIA are similarly not specific, meaning that they can be caused by many different conditions. Fever, for example, is a very common symptom of infection. A child who has joint symptoms needs a thorough evaluation by a qualified medical professional. This evaluation will focus on consideration of many conditions and thus arriving at a specific diagnosis. In some children, the symptoms strongly suggest some type of arthritis. In others, the symptoms and signs are more subtle and require careful investigation by the health care provider. Often, a specialist such as a pediatric rheumatologist is consulted to help with the diagnosis as well as treatment plan. The medical interview is a crucial part of making a diagnosis. You will be asked about the following information. It is important that you answer as completely as possible, as this information may help your child. A detailed physical examination is another critical tool in the evaluation. The examination will include observing, touching, and moving the joints. Muscle strength and flexibility also will be checked. The person conducting the examination looks specifically for evidence of pain, stiffness, swelling, or deformity. The physical examination will cover all systems of the body, with special focus on systems often affected by JIA, such as the eyes, the skin, the heart, and the digestive tract. There is no singular lab test that definitely confirms that a child has JRA. The diagnosis is made from a combination of the information gained from the medical interview and history, physical examination, from a number of different lab tests, and, in some situations, from X-rays and related tests. Because the symptoms must persist at least six weeks to be confirmed as JIA, these lab tests may need to be repeated for the ultimate diagnosis. After JRA is diagnosed, the tests are done every so often to check disease activity and the success of treatment. All of these are blood tests unless stated otherwise. Erythrocyte sedimentation rate (ESR): ESR is a "nonspecific" marker. It does not point specifically to JIA but indicates active inflammation in the body. It is almost always elevated in children with systemic JIA. It usually is elevated in children with polyarticular disease but is often normal in those with pauciarticular disease. Complete blood cell count (CBC): This test measures the amounts of each type of blood cell in a sample of blood. It also indicates the level of hemoglobin, the protein in blood that carries oxygen around the body. A low level of hemoglobin, called anemia, is common in children with JIA. This test highlights abnormalities in the numbers of various kinds of white blood cells (part of the immune system) or of platelets (which help blood clot). It can be used to distinguish JIA from other conditions that might have similar symptoms. The white blood cell count and platelet count are usually normal in people with JIA. Antinuclear antibody (ANA): Antinuclear antibody is one of the antibodies that the body may produce in certain autoimmune diseases (called autoantibodies). As many as 25% of children with JRA have a positive ANA result. A positive ANA result is most common in children with pauciarticular disease and it is an important risk factor for eye disease in these children. It is uncommon in children with systemic JRA. It is linked to an increased risk of eye involvement (uveitis). ANA is also more likely to be positive in conditions related to JRA (such as SLE or scleroderma) than in JRA. It is often used to rule out these conditions in a person with arthritis symptoms. Rheumatoid factor (RF): Rheumatoid factor is actually a group of autoantibodies that occur in some people with RA, JIA, and related conditions. It is most often positive in children with polyarticular JIA and is rarely positive in children with systemic JIA. It is most often used to help determine which type of JIA a child has. Adolescents are more likely to have a positive RF result than younger children. In fact, many consider a positive RF result a sign of JIA progressing to adult-type RA. Your child's health care professional may order X-rays or similar imaging studies. These images may help confirm the diagnosis of JIA or suggest other conditions that might cause similar symptoms. X-rays: X-rays give information about whether or not damage has occurred in the joint. Bone scan: A bone scan may be necessary if the results of the workup do not support the diagnosis of JIA. A bone scan can detect inflammation in the bone and other abnormalities that do not show up well on X-ray. MRI: MRI produces images of joints, but is much more detailed than plain film X-ray and gives a better three-dimensional view of the joint. It is especially useful if there has been a fall or accident that might have injured joints. It usually is not ordered unless the results of the workup do not point clearly to a diagnosis of JRA. CT scan: CT scan also is similar to X-ray but provides much greater detail. It may be ordered when the results of the workup do not support the diagnosis of JIA. CT scan is particularly good at ruling out tumors and other bony abnormalities that could cause arthritis-like symptoms. Dual-energy X-ray absorptiometry (DEXA) scan: DEXA scanning is used to measure bone density and can identify osteopenia or osteoporosis (loss of bone tissue) in children with polyarticular JIA. Other tests may be ordered in specific circumstances. Most children with JIA do not require these tests. Arthrocentesis: This is sometimes called "joint aspiration." It means the removal of a sample of synovial fluid (fluid from a joint cavity) for testing. It is usually done to rule out infections in the joints. Synovial biopsy: An orthopedic surgeon uses a probe to remove a small amount of the synovial tissue from a joint. The tissue is examined under a microscope for clues as to what is causing synovial damage. This may be helpful to exclude other conditions that can cause symptoms similar to those of JIA. The main goal of treatment in children with juvenile idiopathic arthritis is help them live as normal a life as possible. To be successful, this treatment must address all aspects of the disease, including medical problems and complications, physical functioning, school performance, and social and emotional adjustment. Care requires the coordinated efforts of a team of professionals. This care may be overseen by the child's primary care professional, with consultation from a specialist in rheumatic diseases such as arthritis and similar conditions (a rheumatologist), preferably one who specializes in rheumatic diseases of children, as well as specialists in eye problems (ophthalmologist), skin problems (dermatologist), heart problems (cardiologist), digestive problems (gastroenterologist), kidney problems (nephrologist), lung problems (pulmonologist), and/or orthopedic surgery, when necessary. Medical treatment is only one aspect of the management. The team also may include physical and occupational therapists and a psychologist or counselor. A social worker can help the family cope with the social, financial, and emotional aspects of the disease. Although medication is the cornerstone of treatment of JIA, medication alone is unlikely to be optimally successful if the child is not also receiving appropriate physical therapy, emotional counseling, and school assistance. Self-treatment is not encouraged in JIA. Without appropriate inflammation-stopping medical treatment, the inflammation in JIA progresses and becomes worse, increasing the risk of permanent damage to joints, eyes, and other body systems. You can take steps at home, however, to improve your child's comfort and decrease his or her chance of becoming disabled with JIA. Encourage your child to be as active as possible. Bed rest is not part of the treatment of JIA except for children with severe systemic disease. Indeed, the more active the child, the better the long-term outlook. Swimming and water aerobics are ideal activities because they place no stress on the joints. Children may experience pain during routine physical activities and thus must be allowed to limit their own activities, particularly during physical education classes. A consistent physical therapy program, with attention to stretching exercises, pain avoidance, joint protection, and home exercises, can help ensure that a child with JIA is as active as possible. Make sure your child is eating enough to maintain a healthy weight. Some children with JRA have little appetite. They need to be encouraged to eat enough calories to maintain a healthy weight and a proper energy level. A balanced diet that provides all required vitamins and minerals is essential, including magnesium and vitamin D. It is important to have an adequate number of servings of calcium-rich foods each day. While there is no evidence that this actually improves JRA, it does help keep bones strong and flexible. Ask your child's health care professional for information about diet and nutrition for your child. He or she can refer you to a dietitian if necessary. Help your child learn techniques for dealing with the discomfort and pain of JRA. Often, combining pain-relieving medication (analgesics) with other techniques gives the best balance of pain relief with fewest unwanted side effects. Techniques such as biofeedback, progressive muscle relaxation, meditation, deep breathing, and guided imagery can help children overcome pain. Hot baths or showers, a warm bed, range-of-motion exercises, and hot packs can relieve morning stiffness. Some children respond better to cold packs than to warmth. A plastic bag of frozen vegetables makes a great ice pack. The aim of treatment is to stop or slow down the progress of inflammation, thus relieving symptoms, improving function, and preventing joint damage and other complications. Specific objectives are to reduce joint swelling, stiffness, and pain; maintain full range of motion of all joints; and identify and treat complications early, when they can be stopped or reversed. The success of treatment is checked by regular physical examinations and interviews. Medication is the foundation of treatment in JIA. The medications that work best in JIA reduce inflammation, which in turn reduces symptoms. Aggressive, early treatment is the best way to stop or slow the disease over the long run as well as prevent permanent joint damage. Various classes of medications used in JIA are described here. Nonsteroidal anti-inflammatory drugs (NSAIDs) reduce inflammation, swelling, and pain. They work by blocking an enzyme called cyclo-oxygenase (COX), which promotes inflammation. These drugs are used to treat all types of JIA and are usually the first choice of treatment. An NSAID alone may be adequate in pauciarticular disease and mild cases of polyarticular disease. Children with more severe disease often require a second drug to be added to the NSAID. This is usually a drug from another class, since taking more than one NSAID does not help the disease and may cause severe side effects. It usually takes at least four weeks to determine whether treatment with a specific NSAID is going to work. Aspirin is no longer a first choice in JIA because of its side effects. The side effects can be (but rarely are) serious, especially those in the digestive tract and liver. A newer generation of these drugs is called the COX-2 inhibitors. These drugs are much less likely than other NSAIDs to cause digestive side effects in adults. The COX-2 inhibitor, celecoxib (Celebrex), is commonly used. Predicting which children will respond to a particular NSAID is impossible. Children who show no improvement after one to two months of treatment may benefit from changing to a different NSAID. Common side effects include nausea and vomiting, stomach pain, and anemia. Other side effects depend on the NSAID. Disease-modifying antirheumatic drugs (DMARDs) are not a single class of drugs. Rather, they are a wide variety of different drugs that act in many different ways. Their main similarity is that they interfere in the immune processes that cause inflammation and JIA. DMARDs can slow or stop the progression of JIA and thus prevent joint damage and disability. Examples of DMARDs include methotrexate (now considered the "gold standard" for those with JIA), sulfasalazine (Azulfidine), azathioprine (Imuran), cyclosporine (Sandimmune, Neoral) and several others. Side effects include immune suppression which may result in an increased risk of infection, lung toxicity, liver function abnormalities, abdominal pain and decrease in appetite. DMARDs may be given alone or in combination with other types of drugs. On the other hand, successful DMARD therapy may eliminate the need for other anti-inflammatory or analgesic medications. Many, but not all, work by stopping the autoimmune response; they are called "immunosuppressive drugs." These drugs do not work for everyone with JIA, but they give substantial relief to many. DMARDs may not reach their full effect for several months. It is important that the child keeps taking the medication for at least that long before you decide that it is not working. Until the full action of a DMARD takes effect, your child's health care professional may prescribe anti-inflammatory or analgesic medications as "bridging therapy" to reduce pain and swelling. These drugs have many potential side effects (which vary by drug). Children taking some of these drugs require regular blood tests to check for side effects. The immunosuppressive drugs impair the immune system's ability to fight infections. Anyone taking one of these drugs must be very vigilant to watch for early signs of infection, such as fever, cough, or sore throat. Early treatment of infections can prevent more serious problems. These drugs have been shown to improve signs and symptoms (as well as quality of life) in most children with JIA. Biologic response modifiers are a newer, specialized type of immunosuppressive drugs. These agents are carefully designed to block the actions of natural substances that are part of the immune response, such as tumor necrosis factor (etanercept [Enbrel]) or interleukin-1 (anakinra [Kineret]). Therefore, these agents inhibit the autoimmune reaction that causes JIA. Blocking these substances reduces joint inflammation and thus relieves symptoms and improves the child's overall condition. There are several different versions of these agents, and in some children JIA will get better with one version and not another. Although these agents slow down inflammation in a significant proportion of children with JIA, they do not usually lead to remission. It may take about two to three months to see whether a biologic agent is working in a specific individual. Children with an infection (especially tuberculosis), cancer now or in the recent past, or certain types of nervous system disorders cannot take these agents. These agents improve signs and symptoms and quality of life in many people with JIA. Glucocorticoids ("steroids"), another group of immunosuppressive drugs, are very potent anti-inflammatory agents that block inflammation and other immune responses. All steroids work in the same way; they differ only in their potency and in the form in which they are given. They stop or slow joint damage and reduce symptoms. These drugs can be given as pills by mouth, into a muscle (intramuscularly), into a vein (intravenously), or as an injection directly into a joint. Steroids given in high doses can have many side effects. They tend to lose their effectiveness over time while still causing the same side effects. Furthermore, they can be given safely only for short periods -- a few weeks or months. Therefore, these drugs are commonly used to bridge the gap while waiting for a DMARD to reach full effect. These agents are not for everyone. Your child's health care professional will decide whether glucocorticoids are right for your child on the basis of his or her overall medical condition. In children, these drugs are typically given at the lowest possible dose for the shortest possible time to avoid side effects. It is very important not to stop taking a glucocorticoid abruptly, as this can be dangerous. The only safe way to stop taking these medications is to gradually lower (taper) the dose. If your child seems to be having severe side effects, talk to his or her health care professional before stopping the drug. Analgesics are drugs that reduce pain but do not affect inflammation, swelling, or joint destruction. Acetaminophen/paracetamol, tramadol, codeine, opiates, and a variety of other analgesic medications can be employed to reduce pain. Acetaminophen is sometimes used for children with mild JIA who cannot take NSAIDs because of hypersensitivity, ulcers, liver problems, or interactions with other drugs. At very high doses, however, this drug also can harm the liver. These agents usually are given only with other medications. They should be given only under the supervision of your child's health care professional. Physical therapy helps preserve and improve range of motion, increase muscle strength, and reduce pain. Hydrotherapy involves exercising or relaxing in warm water. Being in water reduces most of the weight on the joints. The warmth relaxes the muscles and helps relieve pain. Relaxation therapy teaches techniques for releasing muscle tension, which helps relieve pain. Both heat and cold treatments can relieve pain and reduce inflammation. Some children's pain responds better to heat and others to cold. Heat can be applied by ultrasound, microwaves, warm wax, or moist compresses. Most of these are done in the medical office, although moist compresses can be applied at home. Cold usually is applied by ice pack. Occupational therapy teaches your child ways to use his or her body efficiently to reduce stress on the joints. It also can help the child learn to decrease tension on the joints through the use of specially designed splints. Your child's occupational therapist can help your child develop strategies for coping with daily life by adapting to his or her environment and using different assistive devices. Methotrexate (Rheumatrex, Folex PFS): We do not know exactly how this drug works in treatment of inflammatory conditions. It relieves symptoms of inflammation such as pain, swelling, and stiffness. It may be given by injection if the oral form has little effect. Children taking methotrexate have to have regular blood tests to measure whether the drug is having any adverse effects on the liver or blood cells. It is the standard treatment for children with JIA in which joint damage is occurring. Sulfasalazine (Azulfidine): This drug decreases inflammatory responses by an effect similar to that of aspirin or NSAIDs. Gold salts (aurothiomalate, auranofin [Ridaura]): These compounds contain very tiny amounts of the metal gold. They can be taken by mouth or as injections. We do not know why they stop inflammation. Apparently the gold infiltrates into immune cells and interferes with their activities. Gold compounds, once widely used in JIA, are now rarely used in this disease. Azathioprine (Imuran): This drug stops production of cells that are part of the immune response that causes JIA. Unfortunately, it also stops production of some other types of cells and thus can have serious side effects. It very strongly suppresses the entire immune system and thus leaves the person vulnerable to infections and other problems. It is used only in very severe cases of JIA that have not gotten better with other DMARDs. Cyclosporin A (Neoral): This drug was developed for use in people undergoing organ transplantation. These people must have their immune system suppressed to prevent rejection of the transplant. Cyclosporin blocks an important immune cell and interferes with the immune response in several other ways. It is used most often in systemic JIA. Leflunomide (Arava): This drug blocks immune antibodies and reduces inflammation. It reduces symptoms and may even slow progression of JIA. This agent is not suitable for some people with kidney problems. Etanercept (Enbrel): This agent blocks the action of tumor necrosis factor, which in turn decreases inflammatory and immune responses. It is given by subcutaneous injection twice weekly. Infliximab (Remicade): This antibody blocks the action of tumor necrosis factor. It is usually used in combination with methotrexate in children whose JIA does not respond to methotrexate alone. It is given by intravenous infusion every six to eight weeks. Adalimumab (Humira): This is another blocker of tumor necrosis factor. It reduces inflammation and slows or stops worsening of joint damage in fairly severe JIA. This agent is used mainly for people whose JIA has not responded to at least two DMARDs. It is given by subcutaneous injection every other week. Anakinra (Kineret): This agent blocks the action of interleukin-1, which is partly responsible for the inflammation of JIA. This, in turn, blocks inflammation and pain. This agent usually is reserved for children whose JIA has not improved with DMARDs. It is given by subcutaneous injection daily. Abatacept (Orencia) is an agent that blocks the activation of an immune cell called the T cell. It was more recently FDA approved to treat children with JIA. Tocilizumab (Actemra) is a biologic agent which blocks the action of interleukin-6, which has a large role in the inflammation of JIA. It is FDA approved in polyarticular and systemic JIA. Clinical trials of the other biologic response modifiers are now being carried out to see whether these agents offer a benefit to children with JIA. All medications have side effects, and the drugs used in JIA are no exceptions. Most studies of drug side effects are done in adults, and less is known about side effects in children. Side effects for a given drug may be much different in children than in adults. The medical professional who prescribes medication for a child with JIA should watch the child's response very carefully and adjust the dose accordingly. The goal is to find the proper balance between improving the child's condition and minimizing side effects. While surgery is not usually needed in JRA, some children with persisting pauciarticular JRA, despite medical treatment, may benefit from surgical procedures. Joint replacement (often of the hips, in patients with polyarticular JRA) is usually deferred when possible until bone growth has completed. At one time, part of the synovium was removed (synovectomy) in very severe cases to prevent joint damage. With improvements in medical treatment, this procedure is now rarely necessary. A variety of complementary approaches can be very effective in relieving pain. These include acupuncture and massage. These complementary medicine treatments are not necessary but may help your child feel more comfortable. Whenever possible, children with juvenile idiopathic arthritis should receive their care from a multidisciplinary center that specializes in pediatric rheumatologic care. However, such centers are not common and are mostly confined to large medical centers. Children with JIA must be evaluated regularly by the provider supervising care of their disease. This provider will give referrals to appropriate specialists, who will evaluate the child for development of preventable and/or treatable complications. Care will continue throughout childhood and adolescence. Children who go on to develop adult-type RA require medical care for their entire lives. We do not know how to prevent JIA. Following recommended treatment is the best way to prevent worsening of the disease. If left untreated, JIA will continue to worsen and eventually can lead to joint damage and disability, and possibly other serious complications. Usually, JIA responds slowly and gradually to appropriate treatment. Children with pauciarticular JIA are most likely to have progressive improvement in symptoms, range of motion, and function. In many, the symptoms and signs will disappear completely (remission). Many have little disability and a high level of functioning. A small number of patients with pauciarticular JIA develop aggressive arthritis confined to a single joint. These patients require more intensive medical treatment and physical therapy. Some patients with polyarticular JIA have a rapid response to treatment with few residual symptoms. Most, however, have prolonged courses, requiring frequent adjustments in medical and nonmedical therapy. Some have significant loss of function and benefit from extensive physical and occupational therapy. Some have problems with active joint inflammation through adulthood. Complications of JIA can depend on the type of JIA involved. Pericarditis: Unexplained shortness of breath is the most common symptom. Inflammation of the arteries in the hands and/or feet: This may impair blood circulation and cause serious damage to fingers and/or toes. Knee contractures: The knee stiffens in the bent position. Uveitis: This complication of eye inflammation is often without symptoms. It is most common in young girls who have a positive ANA result. It can lead to a decrease in vision. Leg length discrepancy: differences in the length of one leg compared to the other. Involvement of the spine in the neck: The child may have difficulty bending the neck forward. Living with the effects of JIA can be difficult. Both you and your child will sometimes feel frustrated, perhaps even angry or resentful. Sometimes it helps to have someone to talk to. A counselor or psychologist can help the child and family members deal with these negative feelings and develop positive, helpful attitudes. Support groups also can help. Support groups consist of people in the same situation you are in. They come together to help each other and to help themselves. Support groups provide reassurance, motivation, and inspiration. They help you see that your situation is not unique, and that gives you power. They also provide practical tips on coping with your child's disease. There are support groups for the child with JIA, for the brothers and sisters, and for the parents. Support groups meet in person, on the telephone, or on the Internet. To find a support group that works for you, ask your health care professional or contact the following organizations or look on the Internet. If you do not have access to the Internet, go to the public library. Media file 1: Active pauciarticular arthritis. Notice the swelling above the knee. Image courtesy of Barry L. Myones, MD. Media file 2: Active polyarticular arthritis. Notice the swelling of only certain finger joints. Image courtesy of Barry L. Myones, MD. Media file 3: Wrist X-rays of active polyarticular arthritis (same person as Image 2). X-ray shows severe loss of cartilage, bone erosion, and joint fixation and narrowing. Image courtesy of Barry L. Myones, MD. Media file 4: Close-up of the affected joints in a person with active polyarticular arthritis (same person shown in Images 2 and 3). Image courtesy of Barry L. Myones, MD. Media file 5: Inactive polyarticular arthritis. 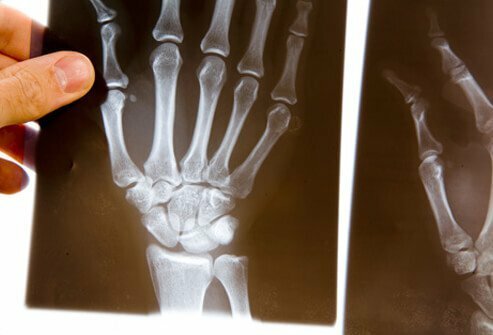 Long-term symptoms of polyarticular disease include partial joint dislocation (subluxation) of both wrists and thumbs, joint contractures, boney overgrowth, and finger deformities (for example, swan-neck or boutonniere deformities). Image courtesy of Barry L. Myones, MD. Media file 6: Hand and wrist X-rays of inactive polyarticular arthritis (same person shown in Image 5). Long-term symptoms of polyarticular disease include decreased bone density around joints, bone fusion, accelerated bone age, narrowed joint spaces, boutonniere deformities (at left third and fourth interphalangeal joints), and partial dislocation (subluxation) of joints. Image courtesy of Barry L. Myones, MD. Media file 7: Eye inflammation (chronic anterior uveitis). Note the weblike attachments of the pupillary margin to the anterior lens capsule of the right eye. This patient has a positive antinuclear antibodies (ANAs) and initially had a pauciarticular course of her arthritis. She now has polyarticular involvement but no active uveitis. Image courtesy of Barry L. Myones, MD. Media file 8: One set of suggested algorithms for the treatment of patients with juvenile idiopathic arthritis (JIA). This treatment is not standardized. Treatment of JIA is based on experience and observation, and it can be controversial. What were the signs and symptoms of your juvenile rheumatoid arthritis? What was the treatment for your juvenile rheumatoid arthritis? How was your juvenile rheumatoid arthritis diagnosed?